How did we get from the Moog Modular to Reaktor? 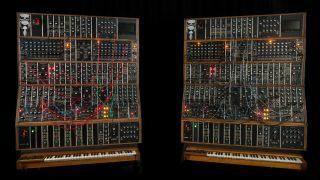 Moog announced that it was recreating Keith Emerson's classic Moog Modular earlier this year. Legend has it that the first commercial synths were realised almost simultaneously by Robert Moog in New York, and Donald Buchla in San Francisco. Moog had worked his way through university by selling amplifiers and theremins, after which he began developing a modular synthesiser with Herb Deutsch in 1963. Moog actively sought advice from musicians, resulting in groundbreaking ideas like the ADSR envelope generator, pitch and modulation wheels and, most importantly, the inclusion of a familiar organ-style keyboard. But others believed that such contrivances were concessions to convention, and therefore anathema to the idea of a truly forward-thinking instrument. Donald Buchla was of that opinion, and championed the use of alternate controllers. Buchla's synth appeared in 1963 after being commissioned by the San Francisco Tape Music Center. With a $500 grant in hand, he set about alleviating the tedium of the existing method of electronic composition: recording individual tones from test oscillators to tape, then splicing them together to form a musical passage. The Buchla 100 Series Modular Electronic Music System was born. Buchla and Moog's systems had similarities, offering modules such as oscillators, envelopes, filtering, various modulation options and voltage-controlled amplification. Both used patch cables to interconnect modules as the user saw fit. Across the Atlantic, a geologist and music boffin called Peter Zinovieff built the first ever personal computer music studio in his garden shed. This costly hobby gave rise to Electronic Music Studios (London) Ltd. where, with the aid of composer Tristram Cary and David Cockerell, he developed the VCS 3, a compact three-oscillator synthesiser. Key inclusions were a joystick and a flexible 16 x 16 modulation matrix that allowed users to route any part of the synth to any other simply by inserting a pin. No patch cables here. Nor was there a keyboard - yet! Like Buchla, Zinovieff scoffed at convention. Fortunately, many musicians disagreed with his assessment, finding the VCS 3 ideal for exotic timbres and encouraged, no doubt, by its relative portability and inviting interface. It was followed by the Synthi A, a functionally identical synth rearranged and stuffed into a plastic briefcase. The VCS 3 was 'semimodular', offering a ‑fixed number of modules - you couldn't add, say, another oscillator to the cabinet, but existing modules were freely connectable. Though enjoying modest sales, early modular synths were soon superseded by portable instruments with hardwired signal paths. Modulars were too big, too unstable and too expensive for the average musician. They would, however, emerge in the following millennium as the instrument of choice for the discerning electronic musician, who would turn to both vintage and modern modular hardware and software to sate an unending thirst for new sounds. There are now more choices than ever before, both physical and virtual, with the latter shod of the size and expense of 'real' machines. Software modular systems have grown in capability and power, and continue to do so, all the while becoming more user and CPU-friendly. As processing power increases, the software modular now eclipses that of its hardware counterpart. Once, software systems such as SynC Modular and Generator (eventually renamed Reaktor!) offered limited real-time capabilities, but such limitations no longer apply in any practical setting. For a complete guide to modular synthesis, check out Computer Music issue 211 (December 2014), which is on sale now.